Before you read any further, it is necessary that I explain that I am not renowned for my prowess in the kitchen. My qualification for food-writing lies in the fact that I am a dedicated foodie who loves eating "not wisely but too well". My cooking skills have definitely improved since the time that my Bolognese sauce imploded showering the walls of our kitchen and our avocado green appliances (that dates this event!) with a burst of red speckled sauce that Jackson Pollock would have admired. However my meal prep these days tends towards baking salmon and chicken or occasionally barbecuing steak or sausage. With the introduction of Cookbook Critiques on ReviewFromTheHouse.com, I decided it was time to get back in the kitchen, sharpen my knives and restock my herbs, spices and condiment shelves. But if the results of my cooking do not look like illustrations in a cookbook, it's not necessarily the fault of the recipes but my partly my kitchen skills and also that I am not a "food stylist." My food photos are all WYSIWYG - 100% authentic, unstaged and taken by my "point-and-shoot" camera. My assignment for The SASSY Club Tastes Tagines was to make a lamb tagine. My fellow SASSYs were making chicken, beef, fish and vegetarian tagines, each having chosen a recipe from "150 Best Tagine Recipes." 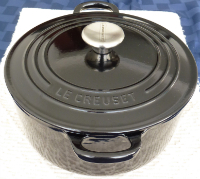 My immediate problem was that I did not own a tagine, and the enamel interior of my Le Creuset oven-proof casserole that I had used for years was badly damaged and I had not replaced it. Hmmm. This did not faze Miss "I am decluttering my place and getting rid of STUFF." I immediately planned a trip to the Gourmet Warehouse where I figured I could acquire a tagine and also some of the ingredients called for in the recipes, like avocado oil and certain spices. 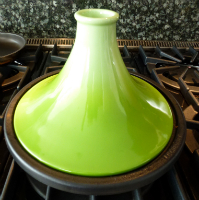 Somehow, a few hours later, I found myself the proud possessor of both the Le Creuset tagine pictured above, and - note the AND - a new ebony Le Creuset casserole. I also acquired a couple of bottles of avocado oil, one plain and one with lime spice, a bottle of Pomegranate Molasses that I had noted in several recipes, and a replacement bamboo mat for making sushi maki. This cookbook review business was getting to be an expensive undertaking. Next I had to buy the fresh ingredients for the dish I chose: Fruited Lamb Tagine. The smallest boneless leg of lamb I could find was 2 Kg. By the time I finished trimming off the fat and cutting it meticulously into cubes I had exactly 4 lbs. The recipe called for 2 lb of lamb and a medium tagine. Oh Oh! At this rather late point in the proceedings it occurred to me to reread the section on Popular Tagine Brands. I should have taken the book with me on my shopping expedition. The tagine I had bought was the 1.9 L medium tagine but I missed the part that said this is really small to medium and recipes calling for a medium tagine need to be reduced by one-quarter. Great, now my math ineptitude was going to further impact my minimal cooking skills. But in a flash of genius I figured that 4 lbs of lamb could be easily divided into 1.5 and 2.5 pound. 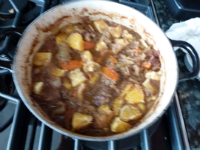 So I could reduce the Fruited Lamb recipe by a a quarter and then make a second dish using the new casserole . 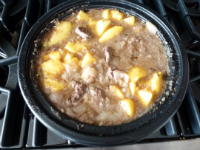 The instructions for Lamb Tagine with Orange and Dates said pre-heat oven to 350 degrees so I could use my casserole in the oven, and I had oranges. All I needed was medjool dates... and cabbage, carrots and lemons. Oh and 2 more onions. A quick Aquabus trip over to Granville Island market and I returned with dates and all. Time to cook. Now I was working with two recipes and the timing was going to be tricky. I had read that the oven recipes need double the cooking time of stove top so I needed to start with that first. As I read the second recipe I realized that though it said to preheat the oven, the instructions were for stove top cooking. Hmmm. Not good. But hey - I would simply double the cooking time. I started my prep work. One of the ingredients called for was coarsely ground almonds. The perfect opportunity to try out the Magic Bullet grinder that my daughter had bought me from Costco, several months ago. But I found a minor hitch when i assembled the grinder - you can read about it in a later post on manuals and editing. 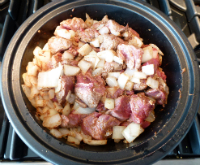 I found it difficult to brown the meat without making space in the tagine base by scooping most of the onions out after browning and then returning them to the dish. 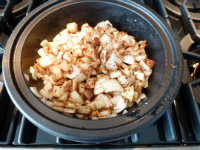 The recipe called for 2 onions (1 and a half for the reduced recipe)and probably I should have used smaller onions. Because of doing two tagines and starting a little later than I had planned, I ran out of cooking time. I would have liked to simmer both dishes longer after the fruit was added. Both tagines ultimately turned out quite well. In retrospect I should have probably not picked two recipes with fruit to give more variety of flavour but both tasted good. And the lamb was tender. All in all a success.